Riding in tandem, the Mayors of Monroe and West Monroe pedaled along Endom Bridge to commemorate a new bicycle route that connects downtown Monroe to downtown West Monroe. It was long-awaited sight! Monroe Mayor Jamie Mayo and West Monroe Mayor Dave Norris along with other riders cycled across the bridge that’s part of a larger 7.1-mile designated bike path through Monroe and West Monroe. The new bicycle path in West Monroe begins at the foot of the Endom Bridge; travels through Lazarre Park before looping back to the bridge; and heads north along Riverside Drive to the Forsythe Park Boat Docks in Monroe. This memorable bike ride will hopefully be the first of many to come. Representatives of both cities, the Ouachita Business Alliance (OBA), the Monroe Advocates for Safe Streets (MASS) and other community leaders are working to develop new bicycle paths that connect throughout Ouachita Parish and enhance the quality of life for its residents. In West Monroe, the City and the West Monroe West Ouachita Chamber of Commerce are working with MASS and other community partners to identify and build new bike routes ̶ some of which will hopefully be ready by 2018. Connecting the two cities with bike routes was a dream of Miles Luke, a founding member of MASS who passed away last December. Miles and members of MASS helped spearhead the development of the multiple bike paths in Monroe over the past several years. Since 2009, six bike routes have been dedicated for a total of 26.45 miles of bicycle pathways. Cycling over to Ruston, the City is working hard to become the “Healthy Active Lifestyle Capital of North Louisiana!” In April 2016, voters approved a quarter-cent sales tax to fund the Moving Ruston Forward initiative, enabling the City of Ruston to embark on an ambitious plan to build streets, complete water and sewer upgrades, as well as build active transportation infrastructures, such as walking, jogging and bicycling pathways. The goal is to connect more than 50 percent of Ruston’s households to an active transportation pathway by 2020. This means that within the next four years at least 11,000 people will live within a two-minute bike ride or a ten-minute walk from a healthy, fun, and intuitive way of getting around town. Construction is now underway on the Rock Island Greenway which will be the centerpiece of Ruston’s new bicycle/pedestrian network. Redeveloped from an abandoned railroad right-of-way, this 6-mile trail will dramatically improve community health by establishing unprecedented opportunities for physical activity, active transportation, and exercise. Rock Island Greenway will connect neighborhoods, businesses, schools, Louisiana Delta Community College, Louisiana Center for the Blind, and Louisiana Tech University. The Greenway also greatly expands access to health care, jobs, social support services, cultural centers, and recreation. Furthermore, the Greenway will pass through some of the city’s poorest, most underserved neighborhoods, where opportunities for physical activity and recreation are especially limited. Many of these residents rely on walking and/or bicycling as their main form of transportation. The City of Ruston’s plan, funded in part by a Blue Cross and Blue Shield of Louisiana Foundation grant, focuses on reducing the harmful health outcomes related to chronic inactivity and social inequity by filling the most critical gaps in Ruston’s active transportation infrastructure. “To inform this plan, the Mayor’s Office and Public Works Departments, along with the Lincoln Parish GIS District, have analyzed US Census data, average daily traffic surveys, population density, Ruston Police Department and Louisiana Transportation Research Center crash data; gathered public input at multiple forums; and conducted a preliminary cost/benefit analysis of 75 potential projects in order to identify and prioritize the top three projects that will deliver the greatest health equity impact,” said Ruston Mayor Ronny Walker. “With the Blue Cross and Blue Shield of Louisiana Foundation’s support, 31 percent of Ruston’s households and 55 percent of businesses will be within a half mile of dedicated active transportation infrastructure — dramatically improving mobility for thousands of people of all ages, races, abilities and economic backgrounds — an incredible outcome,” exclaimed Walker! Ruston’s new active transportation pathways expand Lincoln Parish’s already impressive network of biking trails at Lincoln Parish Park and R. L. Cook Park. Ranked among the top 25 mountain biking trails in the nation, Lincoln Parish Park’s 10-plus mile loop was designed in 1992 with input from biking enthusiasts. The mountain biking trail offers many twists and turns, up-and-down steep inclines, and is suitable for all skill levels. The biking system lies inside a 260-acre forested park. R. L. Cook Park’s 1.75-mile biking trail was recently constructed amidst the park’s 28 acres of woods. It features a 22-foot bridge, banked turns and tabletop features for bikers, trail runners and hikers. While the new bicycle routes offer healthy alternatives to travel, they also connect people to their communities in very profound ways. A recruitment team comprised of the City of Ruston, the Ruston-Lincoln CVB and the Ruston Dixie Baseball Association stepped up to the plate and a scored a home run! Mayor Ronny Walker announced (8/14/17) that the City of Ruston won the bid to host the Dixie Youth Baseball (DYB) 2019 World Series for the 8u AA Coach Pitch and Machine Pitch, the 10u AAA Minors Live Arm, the 12u Majors, and the 12u O-Zone. The two week-long, youth baseball tournament will bring in 60 teams from 11 southern states. The economic impact for hotels, motels, restaurants, and other businesses is projected to be at least $6 million for what promises to be the single largest youth sporting event for the City of Ruston and Lincoln Parish. Mayor Walker believes it took teamwork and community support to win the DYB World Series. Walker points to the three-quarter cent sales tax approved in April 2016 that funds Ruston’s master plan, which includes a $15 million sports complex. The brand new, City of Ruston Sports Complex on 170 acres is a big reason why the Dixie Youth organization selected the City of Ruston, according to Mayor Walker. The Sport Complex boasts multiple ball fields, soccer and football areas, a walking track and even a fishing pond. Phase I of the construction on the Sports Complex will be to build out the baseball fields in time for the DYB World Series to be held July 29 to August 9, 2019. Youth Sports Tourism is Big Business! According to Youth Sports Advisory, youth sports tourism is a $7 billion a year industry- just ask any parent with kids in travel ball. Mayor Walker says according to the southern average a typical family spends nearly $500 a weekend for each travel game. The Sporting Goods Manufacturers Association points to the fact that even in an economic downturn, youth sports tourism is almost recession-proof. Parents will sacrifice a couple’s get-away before they’ll sacrifice their children’s sports travel. Youth sports are commonly defined as nonschool-related sport activities that include baseball, soccer, lacrosse, rowing, volleyball and gymnastics. Northeast Louisiana, known as “Sportsman Paradise,” is well positioned to capture this booming youth sports market. The Monroe-West Monroe Convention and Visitors Bureau has been recruiting sporting events as part of its tourism attraction strategy since the early 90s. Scott Bruscato, Senior Vice President of Sales, leads the Monroe-West Monroe CVB’s sports recruitment efforts. Bruscato says Northeast Louisiana and Monroe-West Monroe specifically have great sports facilities and venues; along with partnerships with local universities and team-friendly hotels; and a sports culture that keep youth sporting events coming back year after year. This summer Monroe-West Monroe hosted the Dixie Baseball Majors World Series for 18 and 19 year olds. The event will return to the area for another two years in 2018 and 2019. Also, the Dixie Baseball pre-Major for 16-17 year olds will come to Monroe-West Monroe in 2019. The economic impact of the 2017 Dixie Majors World Series, which brought in 11 teams from across the Southeastern U.S., totaled $175,000 over the five-day period. Over the past six years, Monroe-West Monroe hosted the BMX Cajun Nationals at the Ike Hamilton in West Monroe. More than 800 riders competed in the three-day bike event, generating $168,000 in economic impact. For the first time, Northeast Louisiana also played host to the Collegiate Wakeboarding Invitational August 11th-13th on Bayou Desiard in the middle of the University of Louisiana at Monroe’s campus. Sixteen teams from across the country were invited to duke it out to determine who would be crowned the National Champion. The economic impact of that event totaled $115,000. In just the last six months of 2017, the estimated economic impact for sport tourism in Ouachita Parish is nearly $4.7 million, according the Monroe-West Monroe CVB. With such big returns, communities are investing big dollars to capture a slice of this booming market. The Town of Sterlington in Ouachita Parish passed a half-cent sales tax to fund a $14 million sports complex with five regulation high school baseball fields and five regulation softball fields and two tee ball fields in order to host tournaments. Upon completion of Phase I of construction, the Sterlington Sports Complex (SSC) will be the only complex in the state capable of hosting five high school baseball games simultaneously. Using temporary fencing, SSC could also host up to ten softball or ten youth baseball games at the same time. It’s an investment that appears to be paying off for the Town of Sterlington, since SSC already has a dozen tournaments scheduled for 2018 and is getting daily calls for more business. Sports tourism isn’t just fun and games; it’s serious business! When Kiroli Park in West Monroe opened Smiles Park in June, the $1 million plus, inclusive playground served as an investment in the quality of life for area families. The playground was designed by a world renowned organization in California, Shane’s Inspiration, and is the first of its kind in the southeast U.S. Its unique design allows children with and without disabilities to play alongside each other. Smiles Park offers outdoor inclusive play environments that are age-appropriate and includes safe, sensory-rich play structures. The playground also accommodates wheelchairs and provides special play equipment suited to most types of disabilities. The West Monroe Civitan Club spent four years spearheading and fundraising for this project. Thanks to the generosity of the City of West Monroe and donors who supported Smiles Park, the Civitan Club was able to advance its vision of fostering a bias-free world for children with disabilities. Smiles Park was designed with a fair theme as a nod to the Civitan’s annual fundraiser, the Ark-La-Miss Fair. To help facilitate inclusive play, Shane’s Inspiration has developed educational materials and will help launch workshops and Play Clubs this fall. For more information visit us on Facebook at Civitan Smiles Park or call Kiroli Park at 318-396-4016. As part of its Moving Ruston Forward initiative approved by voters in April 2016, the City of Ruston plans to spend $1 million to redevelop an old railroad right-of-way as a greenway. Named Rock Island Greenway after the railroad that once used this right-of-way, the linear park will boast biking, jogging and walking trails. What is a greenway? It is a linear greenspace that encourages recreation and active transportation such as walking and biking. Rock Island Greenway will eventually run almost 6 miles across the city, connecting neighborhoods, businesses, educational institutions, and recreational amenities. The first leg of the greenway officially opened in June and runs south from the intersection of W. Kentucky and Chautauqua. This twelve foot wide path traverses a native forest aside a small creek. Rock Island Greenway will be the first of its kind in the region and will serve as a vital transportation link that fosters a vibrant and active culture, encourages economic development and opportunity, promotes safety and health, and offers a state-of-the art public space. Learn more about Lincoln Parish’s parks at the Ruston-Lincoln Park Convention & Visitors Bureau. Ouachita Parish boasts nearly a dozen parks, wildlife refuges, and wildlife management areas, including Forsythe Park. Located in the City of Monroe, the 53-acre, urban oasis offers picnic areas, a 9-hole golf course, putt-putt golf, tennis courts, softball, soccer fields, bike trails, and a children’s park. Beach volleyball courts, a jogging path and a public boat launch are located over the levee along the Ouachita River. Black Bayou Lake National Wildlife Refuge is majestic 4,500-acre expanse of lake, swamp, and wildlife habitat for all manner of plants and animal species. Everything from small alligators and turtles to coyote, deer and a wide variety of birds can be found at Black Bayou. Go bird-watching from the wildlife pier or walk along nature trails or kayak on the quiet beauty of the 1,600-acre lake. Learn more about these parks and other natural habitats at the Monroe-West Monroe Convention & Visitors Bureau . Considered the crown jewel in Farmerville’s tourism industry, D’Arbonne State Park in Union Parish ranks as a star attraction in the Louisiana State Park system. The Park draws an estimated 90,000 visitors annually, according to the Louisiana Department of Culture, Recreation and Tourism. From out-of-state visitors alone, D’Arbonne generates $1.2 million in economic impact annually for the local economy and supports 19 jobs. With a 15,250 acre man-made lake as its centerpiece, D’Arbonne State Park offers cabins, tennis courts, a swimming pool, a boat launch ramp, a fishing pier, trailer hook-ups, meeting rooms, and pavilions. The Lake attracts fishermen of all ages and skill levels as well as water sports enthusiasts. Lake D’Arbonne also attracts retirees who have built their second or retirement homes along its shores. Photographers love to capture the Park’s natural beauty from the vantage point of the tree stands in the towering pines. The Park’s rolling hills with its diverse trails are sure to challenge even avid cyclists. Learn more about Lake D’Arbonne Park at the Town of Farmerville. Wildlife refuges, parks, bayou ecosystems and nature preserves dot Morehouse Parish’s lush landscape, creating a tapestry of natural beauty. The star attraction in the Parish’s ecotourism is Chemin-A-Haut State Park, located 10 miles north of Bastrop. The 503-acre park draws nearly 50,000 visitors annually according to Louisiana Department of Culture, Recreation and Tourism. It generates $732,758 in economic impact for the local economy and supports 11 jobs. This historic state park offers many activities on Big Slough Lake, Chemin-a-Haut Creek and Bayou Bartholomew, allowing for fishing, kayaking, canoeing. Chemin-A-Haut Park was designed with families in mind with two playgrounds, open pavilions and an amphitheater available for a variety of events. Portions of the Park are equine friendly and host trail rides. Other green attractions in Morehouse Parish include Handy Brake National Wildlife Refuge and Kalorama Reily Nature Preserve. Learn more about these natural assets at Morehouse Economic Development Corp.
Downtowns represent the heart and soul of any thriving community. They are iconic and powerful symbols, epitomizing the image and character of a city. Given that most downtowns were one of the oldest neighborhoods citywide, they offer rare insights into their city’s past, present and future. They serve an important role in economic and social development, creating a critical mass of activities where commercial, cultural, and civic activities are concentrated. Recognizing the value and importance of downtowns, Northeast Louisiana is investing resources to revitalize these neighborhoods. Communities throughout the region have begun restoring their downtowns and developing new infrastructure to maximize the commercial and cultural potential of these neighborhoods. The City of Monroe broke ground on a new $3.2 million RiverWalk in downtown Monroe. The 2-thousand foot long walkway promises to open up new development along the Ouachita River. Stretching from Louisville Avenue and to the Masur Museum, the brick Riverwalk will tie together restaurants, residential, office, and retail development within the newly revitalized downtown district. New life returns to many historic buildings in downtown Monroe as historic preservation efforts peel back years of bad remodeling and neglect. The former Virginia Hotel which also served as the old State Office Building has been fully refurbished, featuring some of the original flooring and fixtures from the 1920s. Vantage Health Plan invested $22 million to painstakingly renovate the once grand hotel, creating an equally grand, multi-use building with retail on the first floor and office and event space on the upper floors. Soon Castle Hall, a century old historic building in the downtown area, will be redeveloped as a condo complex, adding much needed residential space in downtown Monroe. The former Knights of Pythias’ building which once housed sick families and widows of the war will be converted into 12 condos. Developers Jason and Jennifer Thomas will also redevelop the former Chef Han Food manufacturing building into luxury condominiums. The entrepreneurial couple has purchased other downtown properties for redevelopment. Other private developers have joined the movement to revitalize downtown Monroe, by purchasing older properties for redevelopment. The synergy of public and private development promises to fulfill a dream of many downtown development groups who want to see downtown Monroe flourish as a destination to live, work, and play. Across the River, downtown West Monroe thrives as a commercial corridor- full of life, energy and activity. Reminiscent of its glory days as a booming cotton import and export hub, the Cotton Port Historic District, Antique Alley and surrounding areas once again sparkle after numerous restoration and beautification projects, led by the Downtown West Monroe Revitalization Group (DWMRG). Projects like the installation of large painted medallions at two main intersections revitalize the look of downtown West Monroe. The crosswalk medallions, designed and implemented by ARROW Public Art, depict the cotton industry’s historical modes of transportation. Another preservation project restored an iconic metal sculpture to its former glory. Created by Edmund Williamson, the metal flower sculpture has been located in downtown West Monroe for at least 20 years. Dulled by the elements, its spinning pinwheel flowers rusted by age, the once colorful garden of metal flowers will be restored to its original colors and its movable parts repaired. The sculpture is a highly recognizable piece of public art that helps give Antique Alley its unique character. Another beautification project implemented on both sides of the Ouachita River remind us of our rich entrepreneurial history. ARROW Public Art restored the Coca-Cola murals in Monroe and West Monroe, LA. The popular soft drink was first bottled by the Biedenharn family in Monroe. Joseph Biedenharn built a thriving business empire, including the founding of Delta Airlines in Monroe; but it all started with bottling Coca-Cola right here in Northeast Louisiana. Additionally, DWMRG coordinated fundraising from various partners for ARROW Public Art to implement postcard murals in both downtown West Monroe and Monroe. Work is currently taking place on the mural in West Monroe, and the one in Monroe should begin soon. Downtown Ruston is the heart of this progressive Northeast Louisiana college town. The City’s downtown is considered a Louisiana Historic District, a Cultural District, a Downtown Development District and one of only 37 Main Street Communities in Louisiana. Now, you can add “National Historic Place” to the area’s long list of accolades. Recently, Ruston earned the distinction of having most of its downtown area added to the National Register of Historic Places. 78 downtown Ruston buildings are named on the National Registry – four of which are listed individually, including the Dixie Center for the Arts, the Federal Building, Ruston State Bank, and Ruston USO. This designation allows owners of income producing properties the opportunity to apply for Federal Rehabilitation Tax Credits. By combining the State Commercial Tax Credit and the Federal Historic Rehabilitation Tax Credit, property owners have the potential to offset their rehabilitation costs by 45%. The historic district extends north to south from Florida to Texas Streets and east to west from Bonner to Monroe Streets. This 18-block historic downtown district offers both residents and tourists a slice of life with specialty retail shops, restaurants, restored buildings, historic architecture and unique public art. Farmerville will launch a major downtown restoration program, adding new sidewalks, light poles, and a new irrigation system to water plants along sidewalks in downtown Farmerville- a popular cultural and commercial gathering spot. Downtown Farmerville will also add new parking on the west and northeast side of the Union Parish Courthouse. The revitalization project is expected to begin in 2018. Additionally, an historic Farmerville building, which currently houses the Union Community Action organization, will soon be renovated and developed into the Union Parish Cultural District building. This exciting move compliments the new Union Museum of History and Arts located nearby. Bastrop’s Courthouse Square lies at the center of its historic downtown area. The restored 1914 Morehouse Parish Courthouse anchors an eight-block retail, government, cultural and Main Street district in this small town of more than 10,500 residents. Its historic buildings still serve as the main gathering spot for events and entertainment. Antiques stores, commercial businesses, quaint boutiques and government offices surround the Courthouse, which is listed on the National Register of Historic Places. New retail establishments keep the district vibrant. Roma Bistro, a full-service Italian restaurant, will soon open its doors in this historic district, adding more spice to the area’s southern food scene. Another cultural touchstone that connects the Bastrop community is the Rose Theatre, which is also listed on the National Register of Historic Places. The Rose was built in 1927 as an old vaudeville house. Years later it would become a movie theater; a popular hangout for locals until the late 1970s when it closed its doors. The Theater was reopened in 1985 as a community theater, home to the Cotton Country Players. Run by a dedicated team of staff and volunteers, the Rose hosts performing arts and musical events, including the upcoming Victory Belles from the National World War II Museum in New Orleans on Sunday, July 2 at 2:00 P.M.
Bastrop is also home to the historic Snyder Museum and Creative Arts Center, housed in a circa 1929 home. Volunteers lead heritage appreciation tours using local artifacts from a bygone era. The beautiful gardens at the museum is a favorite venue for local weddings and events. Another exciting preservation project is the restoration and adaptive reuse of the 1927 Bastrop High School, a National Register building once listed as one of the “Ten Most Endangered Historic Sites in Louisiana.” A public/private partnership converted the school into 60 affordable independent living units for senior citizens and has created 15 jobs in the process. The project will increase the tax base, attract retirees to help certify Bastrop as a Louisiana retirement community and will likely lead to the development of related service businesses. The school’s original educational mission continues by offering classes to seniors in the library and by educating the community on the value of historic preservation. Northeast Louisiana celebrated two major economic development wins in just the last two months. On April 28th, Graphic Packaging and DHL announced a combined $274 million investment in Monroe, and on March 22nd, Monster Moto dedicated its new headquarters and assembly plant in Ruston. Graphic Packaging and DHL broke ground on a new 1.27 million square foot, carton converting and logistics facility in Monroe, which will create 93 new direct jobs. Graphic Packaging will also modernize its existing West Monroe paper mill, transforming the plant into a next generation, state-of-the-art facility. Graphic Packaging will continue to employ more than 800 people in its West Monroe mill and in the new carton plant, consolidating the carton production from the company’s two existing carton sites in West Monroe to the new Monroe site. Monster Moto, a high-profile manufacturer of youth-oriented vehicles, cut the ribbon on its new 100,000-square-foot headquarters, assembly facility, warehouse and showroom. Gov. John Bel Edwards, Monster Moto CEO Alexander Keechle, Ruston Mayor Ronny Walker and NLEP were on hand for the grand opening. North Louisiana Economic Partnership (NLEP), an Accredited Regional Economic Development Organization, worked with Monster Moto’s site selection firm to bring the company to North Louisiana. After a comprehensive site selection process, Monster Moto chose Ruston due in large part to the city’s leadership in developing a facility for the company. BASTROP, La. — Bastrop in Northeast Louisiana has been named among the nation’s top 100 micropolitans for economic development by Site Selection magazine, a leading economic development journal. A micropolitan is a statistical area with a population of at least 10,000 but less than 50,000. Bastrop ranked no. 78 out of 575 micropolitans nationwide, with two economic development projects in 2016. The two economic development wins that landed the City of Bastrop in the Top 100 Micropolitan list involved Kennedy Rice Mills and EDP Renewables North America. Last August, Kennedy Rice Mills launched its newest line of organic white and brown rice under the brand KenChaux Rice. The estimated $2 million investment positioned Kennedy Rice Mills to capture a share of the growing organic food market. Kennedy Rice has been growing steadily since it first began construction of its $10 million rice mill in 2011, creating 22 jobs. This latest expansion solidifies the company’s presence in the small community of Mer Rouge, just north of Bastrop. In 2016, EDP Renewables North America, based in Houston, initiated its plan to locate a solar energy plant along the 165 corridor in Morehouse Parish. The project is expected to generate $78.5 million in capital investment and to create two new jobs. EDP Renewables North America is part of the global energy company, EDP Renewables, with wind farms and solar plants in the United States, Canada, and Europe. This is the second time that Bastrop made Site Selection’s Top Micropolitan List. In 2014, Bastrop was recognized for the Drax Biomass’ $120 million investment. The renewable energy company, based out of the United Kingdom, built a wood pellet facility in Morehouse Parish, creating 60 new jobs. For the last five years, Bastrop and Morehouse Parish have landed many economic development projects, including DG Foods, which created nearly 400 jobs and Flying Tiger Aviation which created 21 new jobs. The community took aggressive action to develop a new economic development plan and to rebrand itself following the closure of its largest employer, International Paper. Bastrop’s unemployment rate continues to decline as more and more companies create new jobs in Bastrop and Morehouse Parish. Northeast Louisiana ranks as a top spot for retirees! West Monroe was named in the top three cities for retirees, according to SmartAsset’s third annual study on the Best Places to Retire. The study rates cities by their tax friendliness, recreational and social opportunities for seniors, and availability of medical care. 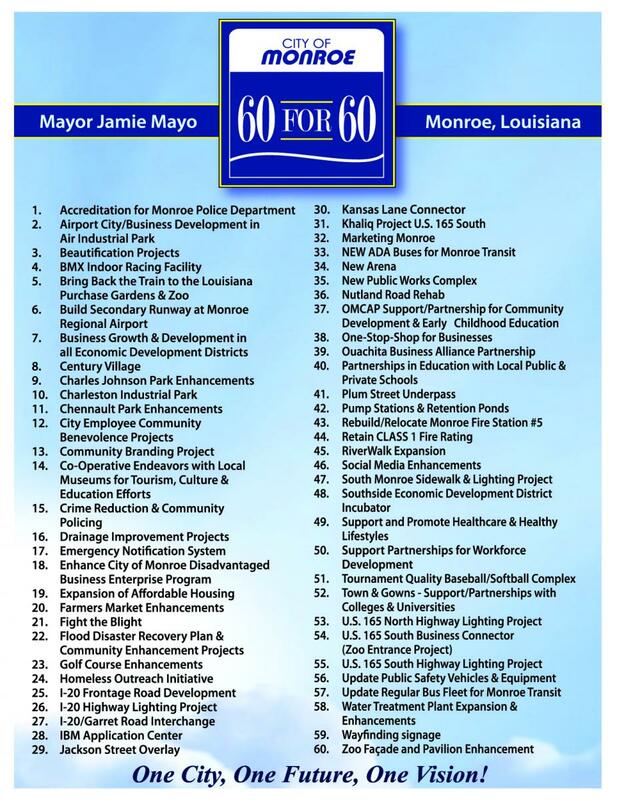 For a detailed look at how West Monroe compared to other top cities in Louisiana, check the table below. The City of Ruston was also picked as a top retirement destination by “Where to Retire,” the only magazine in America geared toward helping people with retirement relocation decisions. Ruston was profiled in a feature titled “8 Tax-Friendly Towns” in the January/February 2017 issue. After analyzing taxes on everything from property to purchases to Social Security, the magazine narrowed the list down to eight towns, including Ruston, that are easy on taxation yet still offer amenities important to retirees. Such amenities include cultural and entertainment opportunities, temperate climates, continuing education, excellent health care and outdoor adventures with breathtaking vistas. Considered the healthcare hub for Northeast Louisiana, Monroe provides quality health care for retirees, along with an exceptional quality of life. Many top-rated hospitals offer specialized and emergency care. A Monroe VA Clinic and Northeast Louisiana Veterans Home provide short-term and long-term medical care to an aging veteran population. Monroe also offers a host of housing options from downtown loft living to upscale neighborhoods to retirement communities. Convenient public transportation, a host of cultural activities, restaurants and shopping cater to the active retiree. With one of the lowest cost of living in Louisiana, the Monroe MSA delivers more “bang for the buck” for seniors on a fixed income. Lake D’Arbonne in Union Parish attracts many retirees to its tranquil shores. Union Parish is recognized as a Certified Retirement Community, the first in Northeast Louisiana. This parish has long been an idyllic location for retirees who want to live near Lake D’Arbonne, a beautiful 15,000-acre lake filled with bass, crappie, bream and catfish. Along with fishing, boating and other watersports, nearby Farmerville offers many other amenities that appeal to senior citizens, including shopping, golf, and other cultural activities. Farmerville recently launched a major downtown restoration program, adding new sidewalks, light poles, a new water system to irrigate plants along sidewalks, and new parking lots on the west and the northeast side of the Union Parish Courthouse. Additionally, an historic Farmerville building will soon be renovated and developed into the Union Parish Cultural District building. This exciting move compliments the new Union Museum of History and Arts located nearby. Historic Rose Theater in Bastrop’s town square stages live performances. The City of Bastrop in Morehouse Parish calls itself America’s Hometown because of its low cost of living, natural beauty, ease of living and family-friendly atmosphere-the same qualities that appeal to many retirees. Bastrop also supports a host of top-rated senior care and living facilities, hospitals and other medical clinics. The Morehouse Council on Aging caters to the needs of its senior citizen community with a host of services and features such as a gym with wellness and balance programs. Less than 30 minutes from an urban center, Bastrop provides convenient access to all the comforts of a larger city (Monroe is 26 miles south) without the hassle of living in heavily populated area. CenturyLink Executive Vice President Stacey Goff announced plans to bring STEM education to Monroe City and Ouachita Schools. CenturyLink, Inc., a Fortune 159 technology company based in Monroe, LA, is partnering with the City of Monroe, the Monroe City School System, the Ouachita Parish School System and the Cyber Innovation Center (CIC) to bring a nationally recognized STEM (science, technology, engineering and math) curriculum to local students. “One of the CIC’s primary missions is to develop a sustainable, knowledge-based workforce that can support the growing needs of government, industry, and academia,” said Craig Spohn, executive director & president of the Cyber Innovation Center. In 2010, the CIC created the National Integrated Cyber Education Research Center (NICERC) to advance its academic outreach and workforce development programs across the nation. NICERC works with its partners to design project-driven, application-based curricula that engage students across primary, secondary, and post-secondary grade levels. The Department of Homeland Security identified NICERC as the national model for cyber education and thus allows for the free distribution of content and curricula. The robust library of curricula, The Cyber InterstateTM, contains numerous full-year, K-12 courses that are modular in form and hands-on. This design provides teachers and school systems with a rigorous program that showcases a systems-level understanding of real-world applications of STEM and cyber. In addition, this context-based approach to STEM incorporates components of liberal arts, allowing teachers to embed the curricula across multiple disciplines. The expansion of a STEM curriculum into local schools is but one of the many initiatives underway to nurture and grow our technology cluster. To support the workforce needs of our employers in Northeast Louisiana, community partners have launched a workforce recruitment and retention initiative, based on rebranding the metro area around Monroe, LA. By marketing a four-parish region in Northeast Louisiana, our communities are working to attract and retain the high-tech workforce needed to support the growth of a technology corridor. The Branding Project includes a Northeast Louisiana Digital Neighbors Program. Digital Neighbors are a connected group of people who are passionate about sharing on social media all the reasons why Northeast Louisiana is a great place to live, work and play. We are now recruiting community champions to join a growing group of Digital Neighbors. It’s easy to become part of this program- just click here to register your social media networks. Once you have signed up, you will receive weekly emails with positive stories about our region. After viewing each email, you have the option to share ready-made content on your Twitter, Facebook and/or LinkedIn with a simple click of the “share now” button. As part of its efforts to create a world-class technology hub in Northeast Louisiana, CenturyLink is hosting “Connect and Protect 2017: A Cybersecurity Summit” on March 8th at its headquarters in Monroe, Louisiana. High-ranking government officials, senior CenturyLink executives and national cybersecurity experts will discuss how you can build a digital fortress for your organization during the day-long seminar. Former Deputy Under Secretary for Cybersecurity and Communications for the National Protection and Programs Directorate (NPPD) and Steven Chabinsky, Global Chair of Data, Privacy and Cyber Security for White and Case, an international law firm, will speak. Chief Executive Officer and President of CenturyLink Glen F. Post, III, will also address the summit participants. Union and Lincoln Parishes are working toward securing funding for a $100 million project to conserve the Sparta Aquifer, which provides drinking water for northern Louisiana and southern Arkansas. An aquifer is a body of permeable rock that can contain or transmit groundwater. Over the past 50 years the Sparta Aquifer has been declining beneath the major pumping centers located in El Dorado and Magnolia, Arkansas and Hodge and Monroe, Louisiana as the rate of discharge exceeds the aquifer’s natural recharge rate. In an effort to conserve the Sparta Aquifer, the Union-Lincoln Regional Water Supply Initiative (ULRWSI) is proposing a water treatment facility to reclaim water from Lake D’Arbonne and provide fresh water to Farmerville and Ruston, thus reducing the draw down on the Sparta. ULRWSI is currently negotiating the purchase of 21.5 acres of land for a water treatment plant. ULRWSI’s mission is to eventually build a pipeline from Farmerville to Ruston and use treated water from Lake D’Arbonne as an alternative to the Sparta. The initiative will supply potable water to Farmerville and Ruston. This massive project stands to benefit not only the potential water users in Ruston and Farmerville but everyone in North Louisiana who uses the Sparta. Hundreds of thousands of residents across northern Louisiana depend on the stressed aquifer for their water supply. Currently, Lake D’Arbonne is not used as a potable water supply. Studies have shown that the water usage from the lake will have minimal impact on lake levels. Data from the last 10 years indicates water flows over the spillway on average nine months a year. Instead of losing this water, it can be converted to potable water for consumption thus protecting and conserving the Sparta Aquifer for future generations. Nestled in the piney hills of Lincoln Parish in Northeast Louisiana, the City of Ruston with a population of more than 22,000 is a small college town with big plans. Anchored by Louisiana Tech University, a National Tier 1 school with more than 12,500 students, Ruston is investing in its future. In April, Ruston voters approved a three-quarter cent sales tax to fund an $80 million master plan to upgrade and maintain its infrastructure and to enhance the quality of life for its residents. As part of its Moving Ruston Forward initiative, the City plans to spend an estimated $1 million to develop biking and running trails through the city. The initiative got a big boost from PeopleForBikes, which awarded a $10,000 grant to Ruston to redevelop a former railroad right-a-way into a hiking and biking greenway. Similar projects elsewhere have proven transformational. 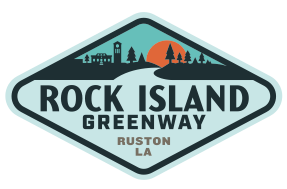 Selected from 205 applicants, the Rock Island Greenway project is a shared-use walking, running and bicycling path and linear park, spanning almost 6 miles across Ruston and connecting businesses, Louisiana Tech University, residential areas and recreational amenities. 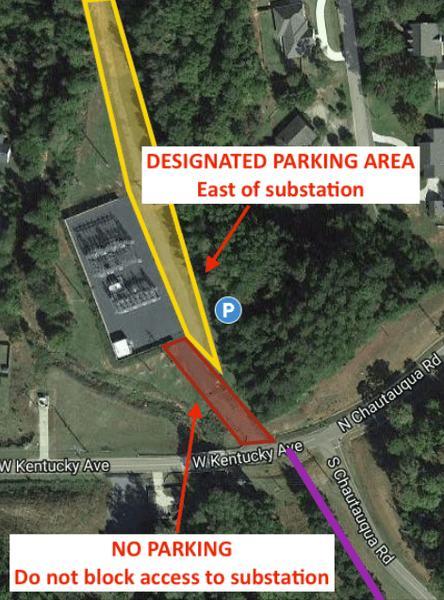 The city broke ground on the path in December and expects the first phase of the project, stretching from W. Kentucky Avenue south to the Interstate-20 service road, to be completed early next year. The grant will be used toward Phase 2 of the project, which extends approximately 2 miles between W. California and W. Tennessee Avenues through Ward 1. This greenway will be the first of its kind in North Louisiana. Ruston’s master plan also calls for a $15 million sports complex, which boasts multiple ball fields, soccer and football areas, and a walking track. The ambitious master plan allows for future business growth with sewer, water, and road improvements along with attracting more families by adding new amenities and enhancing its quality of life assets.